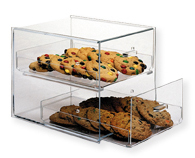 This countertop acrylic bakery display case has two drawers that slide out. Both drawers have acrylic handles on the front. You can put cookies, cupcakes, or anything else under four and a half inches in each acrylic drawer. This cookie display case is an ideal way to display your goods on the countertop without using too much counterpace. This Cookie Display Case offers a spot on way to display your products. Constructed of clear Acrylic, this Countertop Pastry Display, Food Display is an exceptional value. Buy Cookie Display Case now - Use our convenient shopping cart or give us a call and place your order with a knowledgeable service representative today!